I realize that for many people it’s one of their least favorite months, but I find it so hopeful. New year. Days getting noticeably longer. Every now and then a mild day delivers the promise of spring. It’s also a great time to get cozy and read and write and watch good TV. My own version of Hygge. Manchester by the Sea. I saw this film with my mom the day after Christmas. I didn’t love it. I’m in the minority, since the film just garnered a bunch of Oscar nominations. Casey Affleck gave a solid performance. Oscar worthy? Yeah, I guess. The story itself felt predictable to me, and given all the hype, I think I was expecting something a little more unexpected and perhaps a bit more heartbreaking. I DID think the ending was well done. It felt quite realistic, and I’m glad Kenneth Lonergan, the screenwriter and director, decided to go for real over neat and tidy. A big complaint, however: the score. Wow. I can’t remember the last time I’ve watched a movie where I was so distracted by the score. It felt forced and overly loud as if it were trying to get me to FEEL. Anyhow. Not my top pick. The Crown on Netflix. Halfway through and I’m enjoying it so far. The Crown is about the ascension of young Elizabeth to the throne. When I first saw the trailer and caught sight of the actor playing Winston Churchill, I was like, “Who is that? He seems so familiar, yet not.” It was John Lithgow, completely transformed. If you liked Downton Abbey, I suspect you’ll like this Netflix original series. 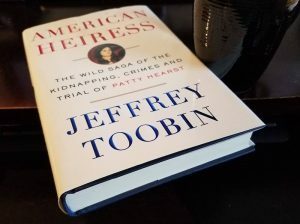 American Heiress: The Wild Saga of the Kidnapping, Crimes and Trial of Patty Hearst by Jeffrey Toobin. I knew very little about the Hearst kidnapping or the times in general (I was just a pup in 1974). This book is illuminating on both fronts. Toobin is a solid storyteller as well. Nitpick: certain words should be used only once in a book (e.g. whipsawed, peripatetic, perfidy — several of these are used within a few pages, and even a few paragraphs, of their first mention). All are great words, but let’s mix it up a bit. I blame the editor for this, not Toobin. An editor’s job is to save the writer from himself or herself. 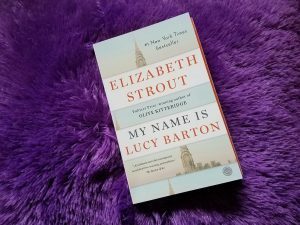 In progress: My Name is Lucy Barton by Elizabeth Strout. Strout wrote Olive Kitteridge, one of my all-time favorite books. The narrator of this book…the voice reminds me of a grown-up version of the little prince from The Little Prince (even though the narrator in Lucy Barton is female). That’s the best way I can describe it. I think I might need to read it again, much like I had to do with The Little Prince, since I believe there’s much subtle wisdom that I know I’m missing on this first read-through. I need to read Strout’s other works as well. Up Next? Either Quiet: The Power of Introverts in a World That Just Can’t Stop Talking by Susan Cain or The Brief Wondrous Life of Oscar Wao by Junot Díaz.